One Alberta company has gone to great lengths to distance itself from the stereotype image of a plumber. Brham Trim, owner and president of The Gentlemen Plumbers, based in Calgary, grew up in the plumbing business. “My grandpa was a plumber, my dad was a plumber.” It was the last thing he wanted to be. However, he realized he enjoyed working with his hands and eventually earned his plumbing ticket. His father suggested he go out on his own. 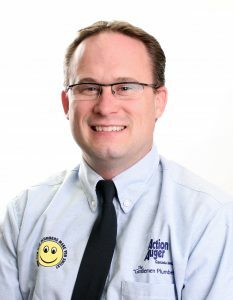 Employees always have a spare uniform in the truck so they can change before they go to the next job, reported Trevor Greenwood, Edmonton regional manager. Brham Trim wanted to create a different kind of plumbing company. Word of the well-groomed plumbers quickly got around. “People started calling us ‘the gentlemen plumbers,’ so we started putting that on our trucks,” said Trim. It wasn’t long before people knew the company more by its slogan than its name, so in 2008 the company made the change official. The Gentlemen Plumbers now has five locations providing service in all aspects of residential plumbing and HVAC. In addition to Calgary and Edmonton, these include Red Deer, Medicine Hat and Lethbridge. There are just over 40 employees and 30 trucks. Hiring the right people is a critical part of maintaining the company’s image. About a year ago the company hired a full-time human resources person to recruit, hire and do initial training, freeing up considerable time for Trim and his managers. “I wish I had done that years ago,” he says. “It’s a delicate topic and you can offend people, but at the end of the day, if I wouldn’t have you in my home with my wife and four kids, I am not going to put you in my customer’s home,” said Trim. The policy eliminates some prospective employees, but it’s a draw for others, he added. The company has one female technician in Edmonton and would like to have more. “We actually find that having women in the trade is a great thing, especially in the service industry. The majority of clients we go to are women and as soon they see a woman show up, it’s almost like a wall comes down,” said Trim. Occasionally someone objects, but that’s rare today, he added. One of the challenges for the company as it grows is to continue to have a small company feel. Daily one-hour training sessions help too. They are voluntary, begin at 7 a.m., sometimes include breakfast and typically everyone shows up, unless they’ve been out on a late-night service call. Topics cover technical issues, customer service and equipment, but can vary depending on needs. Often, a session might be devoted to a problem in the field. “When you’ve got 20 trades people in a room (there’s a lot of experience), so if one technician has a problem chances are someone else has seen something just like it,” said Trim. Managers are all tradesmen, so it’s not unusual to find them on a jobsite. “We have a very hands-on approach to management,” said Greenwood. 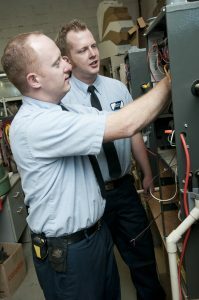 Daily training sessions include things like furnace troubleshooting, here with Kale Trim, left, and Trevor Greenwood. The company use ServiceTitan software to organize its work. Every field technician has an iPad which is tied into a central computer. When they are on the job they make detailed notes and, at the end, provide the customer with a written warranty. The company developed its own straitforward one-page pricing structure. They looked at every type of job and figured out the average cost and how long it would take the average technician to do it. “We put every job that we could possibly do into one of ten levels,” said Trim. Once the technician assesses the job and offers the customer repair options, he assigns it to a certain level. So, for example, he might decide that it’s a Level 4 job, which has a set price. The company tries to avoid callbacks by, among other things, allowing the technicians time to get the job done by not overloading them with calls. “We teach the techs that a job takes as long as it takes,” remarked Greenwood. The company offers two service programs for customers – the Diamond Membership for plumbing and the Platinum Club for HVAC. Members receive priority service (within four hours) and receive a 20 percent discount on repairs. They also receive a full two-year parts and labour warranty, up from the company’s standard one-year warranty. On the HVAC side, at cost of $9.95 per month, the customer’s system is inspected annually and, as long as no parts are used, there is no additional charge. The technician might make minor adjustments to improve system efficiency and comfort. The big benefit is for customers is that, when the furnace or boiler needs replacement, the money they have paid in membership fees is deducted from the price. Strong trade skills and a friendly professional image can go a long way.